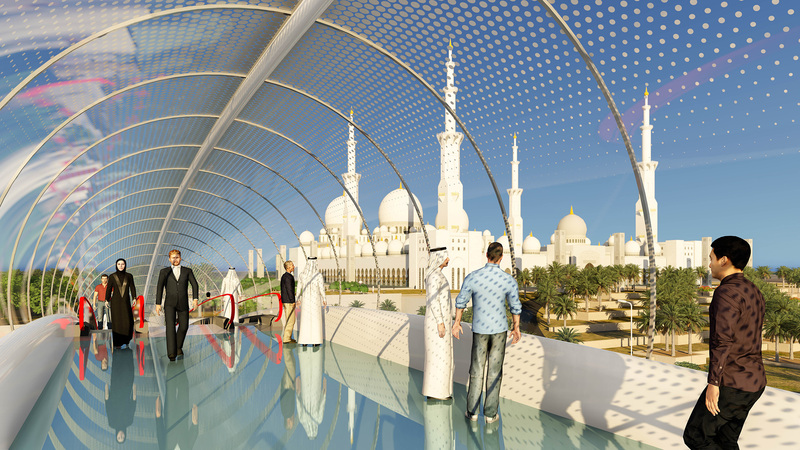 In the near future Sheikh Zayed Grand Mosque will be extended with an underground Visitor Center. 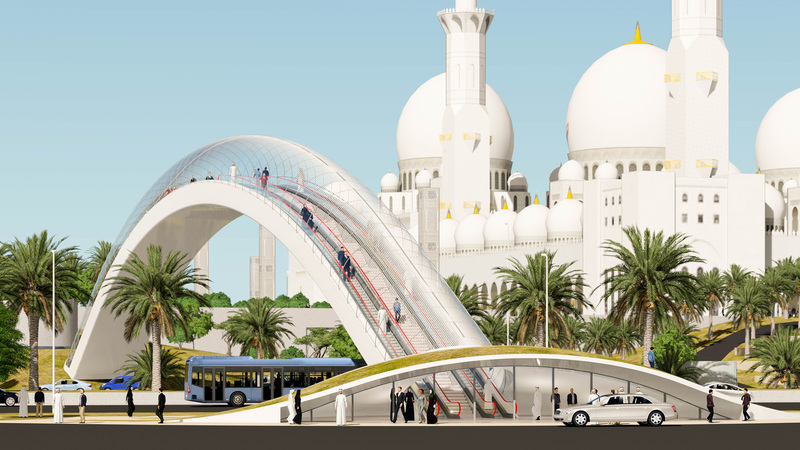 It will also soon welcome an important neighbor on the opposite side of the road: the Memorial for the Martyrs of the United Arab Emirates Army. Both the visitor center and the Memorial are currently under construction. Once in use the ensemble will be the core of the nation. The most important place for worship and the most important place for memory. Currently Sheikh Zayed Grand Mosque is already an important destination in Abu Dhabi, with millions of worshippers and tourists visiting each year. Further significant growth is expected. In order to accommodate this flow, parking area has been added, a comfortable climatised corridor between Visitor Center and Mosque precinct is under construction. 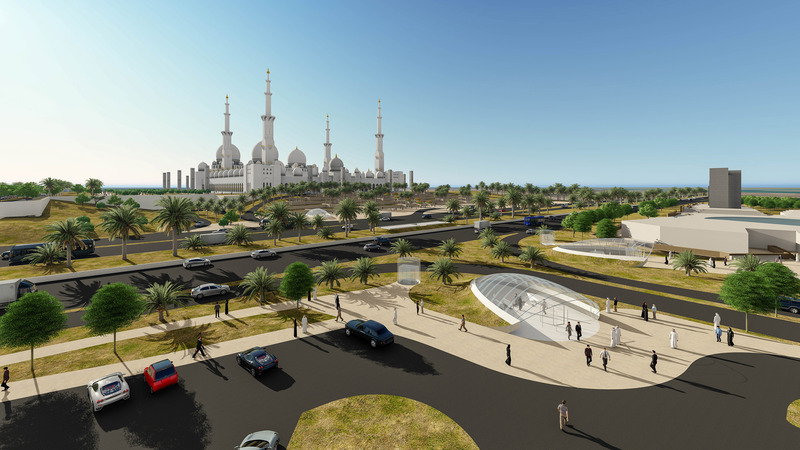 The assignment for this project was conceiving a good connection between the car park area and monument on one side and Mosque and Visitors Center on the other side of the road. In cooperation with Atkins two options were made: The arch and the tunnel. In the first design, the arch, a last element is added in the ensemble. The arch is not just a special place for the visitors, it also fits well in the surroundings. First of all it is an Arabic classic, a Bab (gate) to Mosque and Memorial. A modern gate that is, for cars. The very simple and elegant shape of the Arch does not interfere with the majesty of the Mosque and the Memorial. It is a very different and modest shape. From the road it has the added benefit that it doesn’t block the views to the monuments behind, but rather frames them. It combines functionality and experience, simplicity and dignity. This is the option with maximum attention for experience. 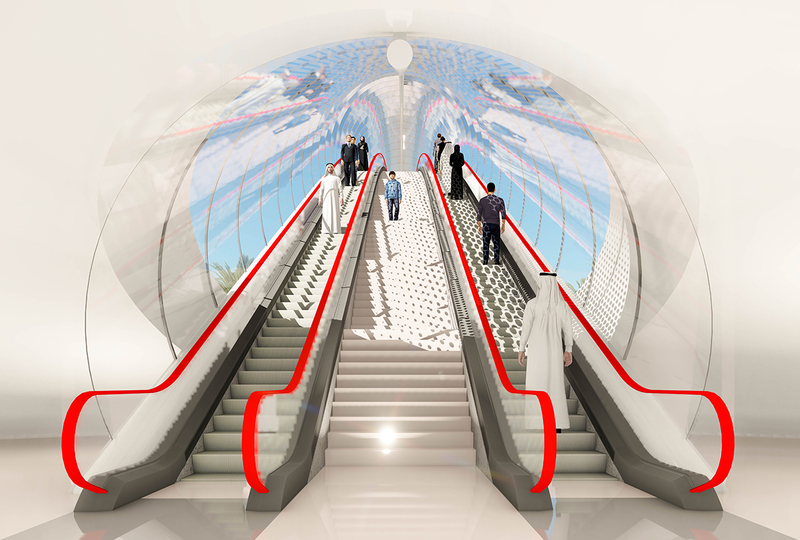 The users are transported comfortably up the curving ramp of the bridge by state of the art arched escalators. At the start, in the enclosed lobby space, one cannot see the end of the escalator, nor what lies behind. Whilst going up the views become more spectacular all the time, almost as if one is in a giant Ferris Wheel. At the top there is ample horizontal space, allowing visitors to enjoy the spectacular views around, from a vantage point 20 meters above the road. Afterwards the journey continues back into the ground and onwards to the Visitor Center or Mosque. 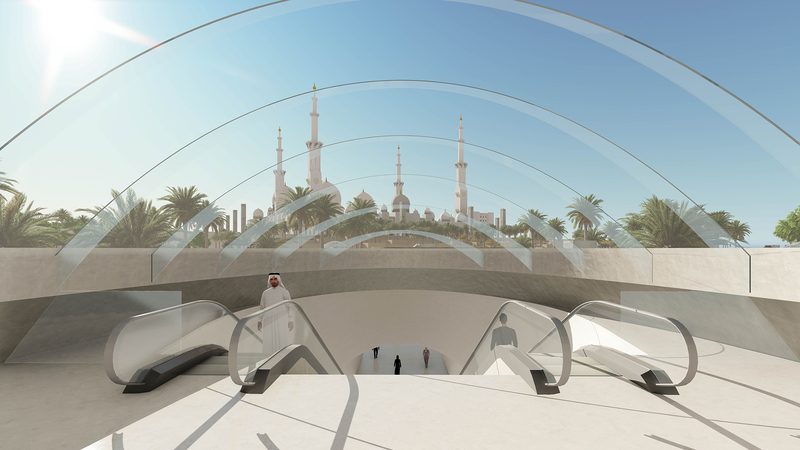 The client has asked us to also investigate an elaborate tunnel, with direct connections to the Memorial, Car Park, Visitors Center corridor and the Mosque. 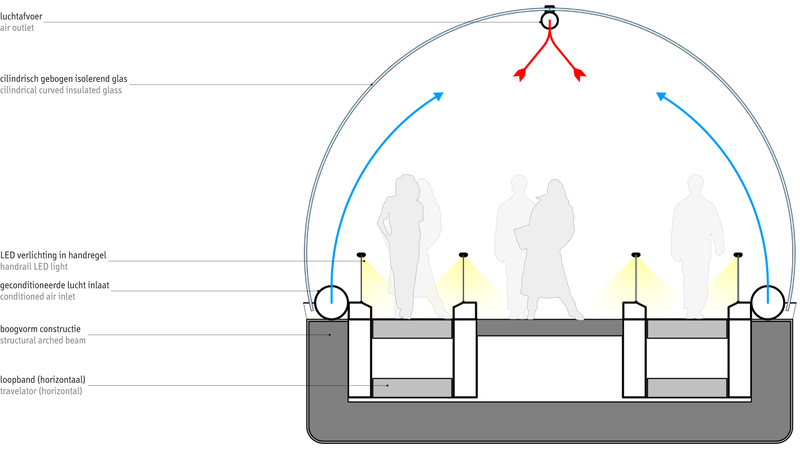 The tunnel variant has been elaborated as option 2. 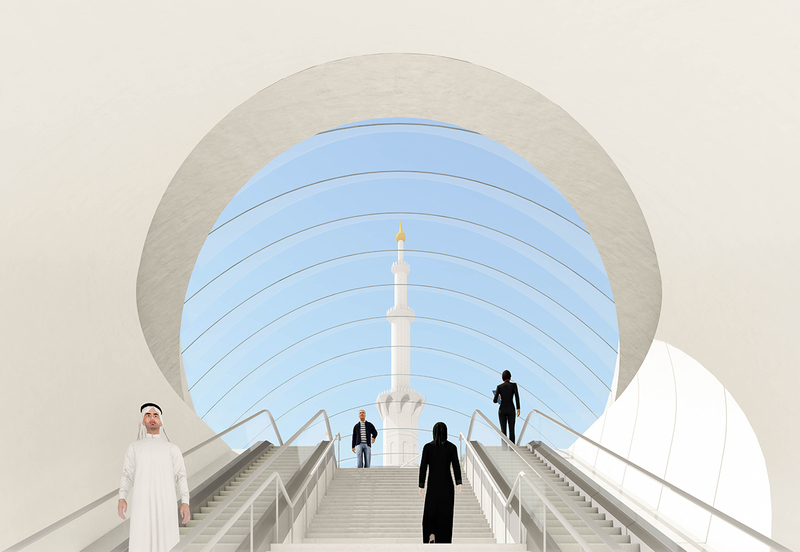 It connects directly to the Grand Staircase in front of the Mosque, the preferred approach for worshippers. 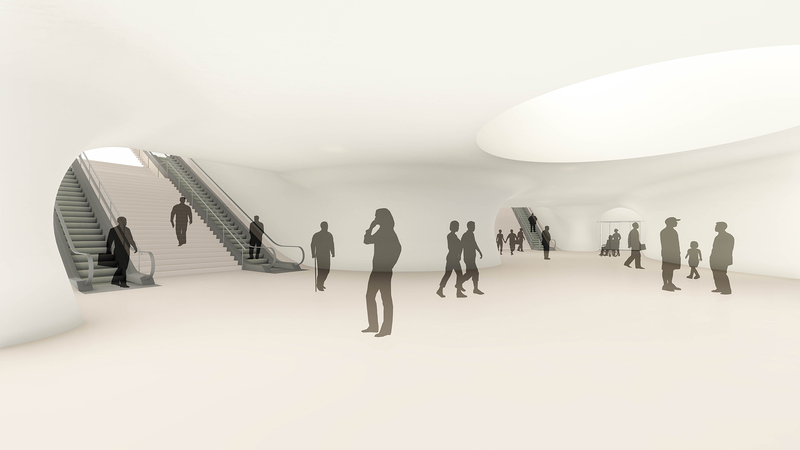 Four destinations are combined in one convincing structure: A comfortable and easily accessible underpass. The end result is a true multifunctional connector. The underpass has three entrances at grade level: at the grand staircase, the monument and the car park. The fourth arm connects to the existing underground visitor center corridor. All three entrances have an identical, restrained, architectural design. We have opted for a fully glazed roof and canopy above ground, through which there are optimum views to the surrounding monuments. 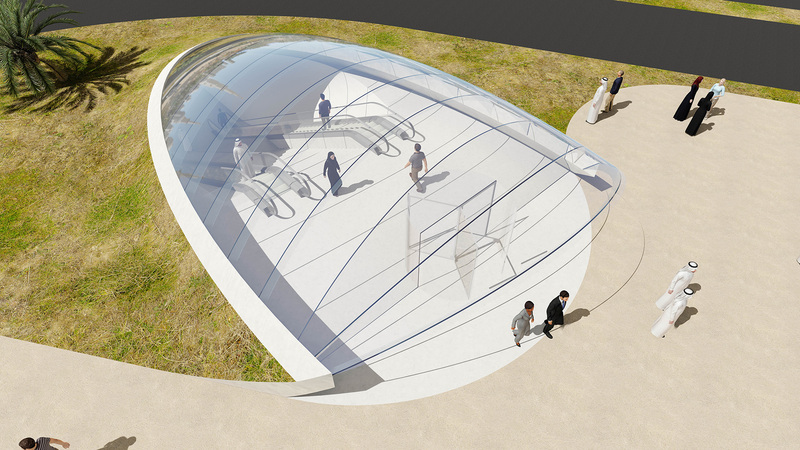 Whilst much smaller and earthbound than the domes of the visitor center, their similar transparent materialisation helps to tie all structures together. 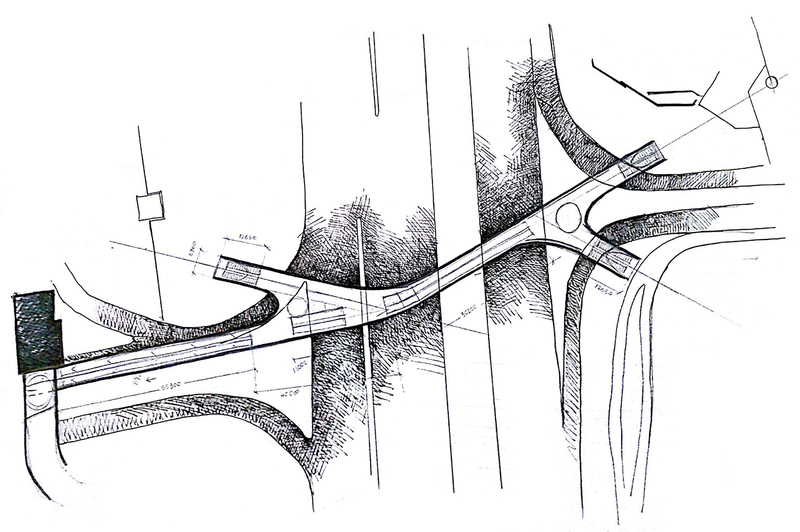 The underpass is designed as a nervous system. 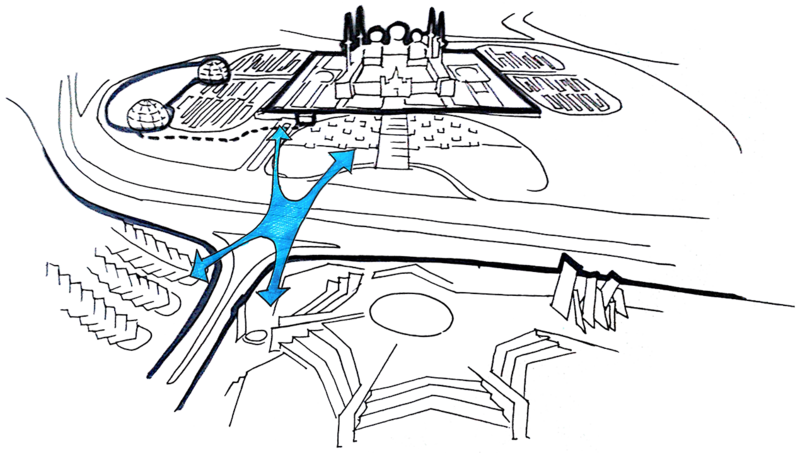 It is one structure, but connects four different destinations mutually. Along the route pedestrians pass through a sequence of “knots and threads”. passages and squares from where routes to the various destinations can be followed. The whole system is clear and unobtruded. There are no columns and the walls are curved both horizontal and vertical. On either side of the road the “knots” are wider areas with daylight from above. These are the places where the users make their choice of direction, as well as their choice of vertical transport. At each of the exits stairs, escalators and elevators are available for transport to at grade level.